The system didn’t last long without repairs, precipitated by the crisis of the 1800 election. Electors could vote for two names for president, with the runner-up becoming vice president. With the Federalist Party’s John Adams defeated, it came down to the candidates of the Democratic-Republican party. But because of a procedural error, Thomas Jefferson tied with his running-mate Aaron Burr. Awkwardly, the tiebreaking vote went to the House of Representatives, which the Federalists still controlled. It took 36 ballots for Jefferson to win his majority. It’s not surprising that four years later the 12th Amendment was ratified. Among other changes, it separated the vote for president and vice president into two processes. The next change to the electoral college, as it came to be known, happened without constitutional changes. One by one, the states began making their presidential picks by popular vote, which the electors were then supposed to echo. The move led to the winner-take-all system for each state that all but Maine and Nebraska practice today. This was not what the Founding Fathers had intended. 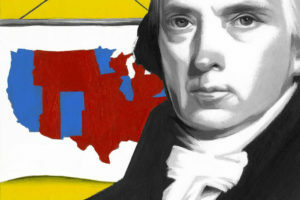 In the 1820s, the aging James Madison suggested various ideas for reform, such as having each congressional district vote for an elector, or even having each member of the electoral college offer two choices for president (neither would become vice president). Congress briefly considered abolishing the college completely, with President Andrew Jackson declaring in 1829 that the more “agents” there were to do the will of the people, the more likely it was that their will would be frustrated. A serious attempt at abolition died in the Senate in 1934. In 1969, after segregationist George Wallace got 46 electoral votes and raised the possibility that neither major-party candidate would win a majority of electors, President Richard Nixon tried to abolish the electoral system—with the aid of his defeated rival, Hubert Humphrey. But Southern and small-state senators stopped the plan with a filibuster. Why has reform failed so often? As many have pointed out, the electoral college was an attempt to balance the power of more populous states with that of more rural ones, to balance the needs of the nation with those of the states. Many have called the solution imperfect, but perhaps it’s a good match for our remarkable but imperfect democracy.